DP Supply – your solutioner for non-dairy ingredients. DP Supply is an operating company of DMK that produces functional ingredients for the global food industry. DP Supply´s core activity is the constant search for new ways to fulfil the ever-changing requirements of your needs. Our aim is to supply our customers with innovative ingredients that possess the right functionality. We produce spray-dried emulsions that not only meet the standards of the food industry, but also highest quality standards. A skilled development team and state-of-the-art production equipment facilitate DP Supply to design and manufacture a variety of powdered ingredients for the bakery, savoury and beverage as well as ice cream and dessert segment. 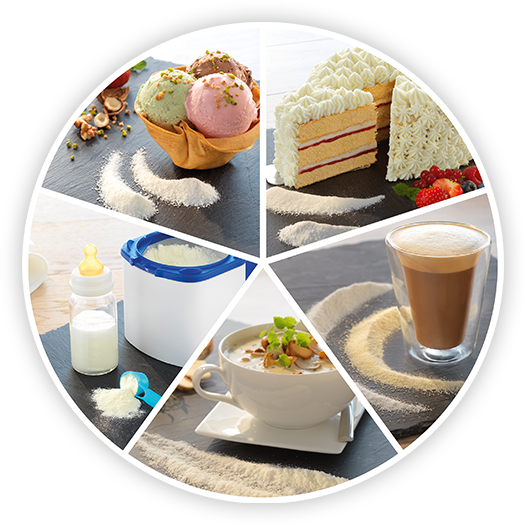 Our products can be used in a variety of application areas like bakery, beverages, ice cream & desserts, savoury and dairy.